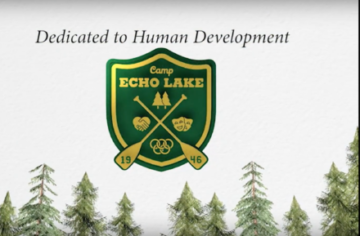 It is hard to keep up with all the fun happening at Camp Echo Lake! On Thursday evening the camp enjoyed “Winter in July!” The Fieldhouse was decorated as a beautiful Winter Wonderland and campers and counselors wore festive holiday gear. Laurie and Brenda opened the event with a fun poem, followed by trivia, a snow machine, “gifts” for each group, and a special reading of The Grinch Who Stole Christmas by Tony, Emily, and Violet. We even had the Grinch show up, but he was certainly not welcomed by the happy campers at Camp Echo Lake! On Sunday Night it was Camp Carnival, one of our favorite camp events of the summer! Each group decorated their booth (marriage booth, counselor dunk, alley oops, bottle ring, disc golf, penny toss, hoop toss, football throw, bocce, baggo, watermelon race, sponge toss, candle shoot, etc.) Not only did the kids have a blast running their booths, they also enjoyed visiting other booths, and enjoying yummy carnival food, such a treat! We all enjoyed hamburgers, hot dogs, fries, twisted pretzels, popcorn, snow cones, and cotton candy…yum! The weather was absolutely gorgeous, and it was a magical event for all! Stay tuned for more fun soon!